Charlie Appleby was appointed as a Godolphin trainer in July 2013, after 15 years working for Sheikh Mohammed as a travelling head lad, stable head lad and assistant trainer. Charlie was previously a keen jockey, riding in a number of point-to-points and amateur flat races. He saddled his first G1 winner in November 2013 when Outstrip landed the Breeders’ Cup Juvenile Turf at Santa Anita, USA. Charlie has recorded more than 600 winners, with his first domestic UK G1 winner coming in October 2014, when Charming Thought won the Middle Park Stakes on Dubai Future Champions Day at Newmarket. He celebrated his first Royal Ascot winner during the 2015 meeting, when Space Age won the King George V Stakes. 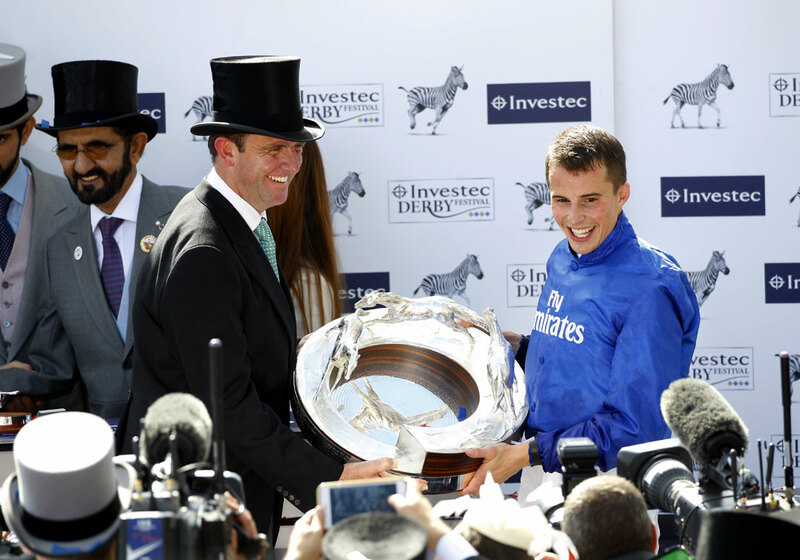 Charlie Appleby in the winners' enclosure at Royal Ascot with Space Age. 2017 saw him saddle four G1 winners around the world: one in Australia, two in France and Wuheida's scintillating victory in the G1 Breeders' Cup Filly & Mare Turf at Del Mar, USA, in November. Charlie was crowned Champion Trainer at the 2018 Dubai World Cup Carnival and enjoyed a terrific Dubai World Cup night with two winners at the highest level, courtesy of Jungle Cat and Hawkbill who won the G1 Al Quoz Sprint and G1 Dubai Sheema Classic respectively. A dream came true for Charlie in June 2018 when his charge Masar became the first Godolphin horse in the famous royal blue silks to win the coveted G1 Derby at Epsom. He also became Charlie's first Classic winner. Just 17 days later, Charlie's charge Blue Point stormed to victory in the G1 King's Stand Stakes at Royal Ascot, becoming his first G1 winner at the prestigious Royal meeting and Godolphin's first winner of the race. And in November 2018, Charlie trained Cross Counter to win the G1 Melbourne Cup at Flemington, Australia, just 4 days after Line of Duty landed the G1 Breeders' Cup Juvenile Turf at Churchill Downs, USA, epitomising the Godolphin philosophy of pushing global boundaries and striving for perfection. Charlie won the prestigious International Trainer of the Year award for the third year running in 2018. The International Trainer of the Year award, presented in London, is sponsored by the Newmarket-based International Racing Bureau and honours the trainer, who has made the biggest impact globally throughout the year. Charlie divides his year between Marmoom stables in Dubai in the winter months and Moulton Paddocks in Newmarket, UK, the rest of the year. A delighted Charlie Appleby with Wuheida after her Breeders' Cup win at Del Mar, USA.